We’ve begun our journey to Costa Rica! As we journey we ask for your prayers of safety and that God direct every step taken to accomplish all that He wants us to. Our hope with this blog is to give you a window into all that God is doing here in Costa Rica! We are alive and well in Costa Rica! We have had an awesome 2 days getting to serve and share the gospel with the community in San Jose. Yesterday, we led a small VBS for around 30 teenagers at a nearby ministry. We fellowshipped with them, played games, and shared the story of Joseph with some great acting by our team members. Today we attended a local church service and visited houses and families in the community around the church. We had the amazing opportunity to pray for and share the gospel with around 30 households! Church, let’s rejoice: Between yesterday and today, we have seen 9 people accept Jesus Christ as their Lord and Savior! We are so thankful and excited for what we have seen God do in these short two days. Please continue to pray for our team as we GO with the gospel in Costa Rica! What an amazing day we had today! This morning, we had planned to serve at children’s home that cares for neglected and abused children. However, God had different plans! Due to some sick children at the children’s home, we were not able to serve there. Instead, we went to a nearby home of a couple that had adopted over 100 neglected children over numerous years! There we cleaned up their playground, sorted some beans, and played with the children at the home. It was an awesome time of being the hands and feet of Jesus Christ. After an amazing lunch at Taco Bell, we went back to the same community as yesterday afternoon. We had the opportunity to give around 30 homes a gift, pray with them, and share the gospel to those who had not heard it. As a result of these home visits, many people heard the gospel and one person accepted Jesus Christ as Lord and Savior! Please continue to pray for our team and the people we will come in contact with over the next few days! After 4 days in Costa Rica, it is clear that God is moving here in incredible ways! We started the morning off at the same location as yesterday morning. Today, the ladies helped with drying, folding, and hanging up the laundry of around 48 children who live at the home. While they were serving, the guys took the children to a local playground and had competitive game of soccer (until the ball was kicked over the fence). It was a great morning serving and fellowshipping with the children. After a tasteful authentic Costa Rican lunch, we went to a local ministry site and conducted home visits with the families of the children that attend the ministry. We visited around 10 homes, gave them a gift (which included rice, beans, tuna, and a Bible), prayed for them and shared the gospel. In these home visits, we saw the Lord save 3 people! Praise God! After visiting homes for the last 3 days, we have noticed that the amazing thing of these visits is that we cannot plan for them and must let the Holy Spirit guide the conversation and encounters. We had an awesome day today and look forward to an awesome day tomorrow! We ask that you would continue to pray for our team as we serve and share the gospel with the community of San Jose. Hello church! Today was an amazing day in San Jose. Over the week, our team has described this trip as a “Plan B” trip and this morning was no different. We were unable to serve at the original location we had planned, so we traveled to downtown San Jose to pray for areas of extreme spiritual darkness. For example, we stopped near a hotel and park where prostitution is very prevalent and spent a few minutes in prayer over the situation and those involved. In addition to this place, we prayed over a hospital and other areas where drug addiction, prostitution, and homelessness was present. It was a special “Plan B” morning spending time praying against the darkness just as the Bible commands us to do! In the afternoon we made a quick stop at a local women’s ministry for single mothers. While we did not have the opportunity to serve there, many of our team members purchased hand-made bags to support the ministry and the mothers involved. From this ministry, we made a short drive to another local ministry where we helped put on a VBS for around 60 young children! With them we played games, sang songs, and shared the story of Joseph and how God had shown us love and mercy in the person and work of Jesus Christ. Even though we are winding down our trip, we are still so pumped to see what God is going to do in these final 2 days! We thank you for your prayers and ask that you continue to pray for our team as we serve in Costa Rica! Today was such a memorable day here in Costa Rica! This morning, we traveled about 2 hours to go zip lining through the mountains of Costa Rica. Even though some of team members were nervous to to it, we had a great time flying through the air. Everyone made it out alive! Afterwards, we ate lunch and made a couple of stops for some tourist shopping. We then drove to a local ministry sight this evening to assist them in their feeding program that they have for children from the community. There we helped serve them, played games with them, and led the Bible story of Joseph. After the story, Pastor Alex shared the gospel and we gave each children a gospel bracelet and a gospel track to take back home with them. It was an awesome day having fun and serving in San Jose! Today was our last day of ministry in San Jose, as tomorrow morning we head to the airport. Please continue to pray for our team as we head home! We have arrived back in the States! It was an amazing week in San Jose and we saw God do some incredible things. 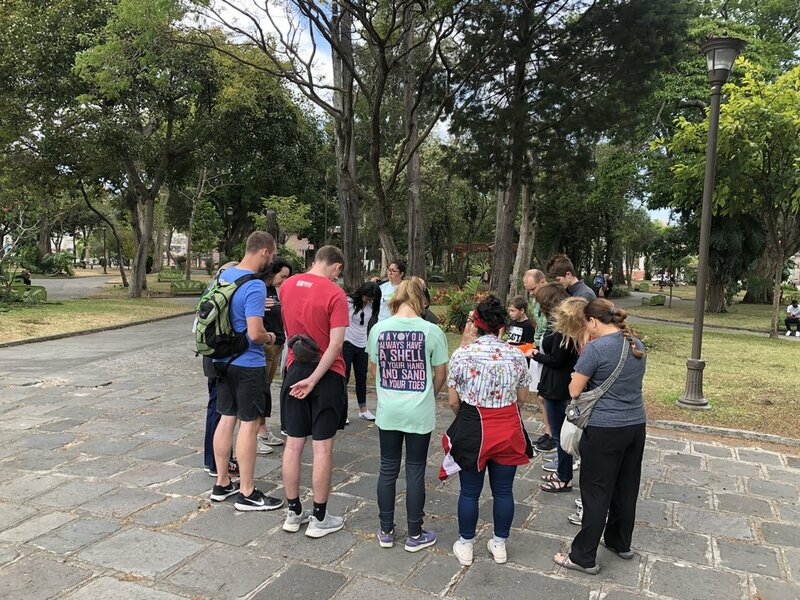 Throughout the week, we put on multiple VBS’s, made home visits, had a prayer walk through downtown San Jose, and served in other various ways. We are so thankful for what God did and we are so thankful for your prayers this past week! Because HE is worthy, we went to Costa Rica!